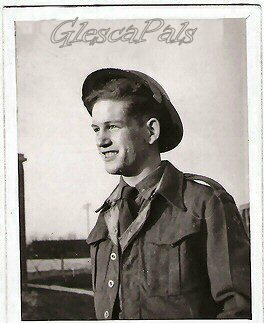 ....This is my big brother Robert Dow, taken in 1948 when he was doing his National Service in the REME. He spent a lot of his service time in Cowglen Military Hospital as he contracted pneumonia. He worked as a caulker in John Brown's Shipyard, then in UCS etc. He was very active in his Union and had a special presentation for 50 years service. He latterly lived in Clydebank, but he and his wife Jeannie used to live in Beechgrove Street. They met at Riverside School, (Jeannie lived in Lily Street when we were in Sunnybank Street.) Sadly, he passed on in 2004. 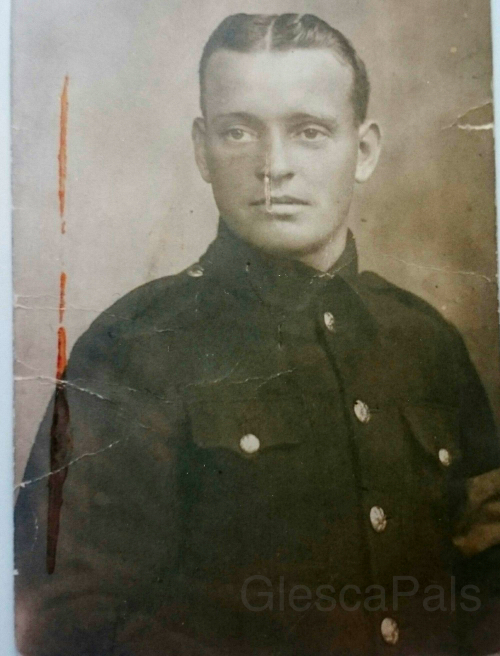 .... a photo of my much loved Dad James Gall born 1920 in the Black Isles. His family moved to Glasgow & lived in Whitevale Street. 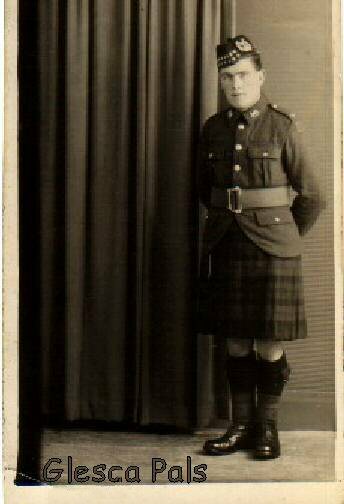 He joined Gordon Highlanders in 1939 and spent most of the war in Burma attached to the Royal Tank corps. as a tank driver before coming home late 1945. He lived with Great Grannie Kate Coyle in Shettleston. Married Cathy Keays from Shettleston and they had four children, Rod, James, Margaret and Jane. Lived at 45 London Rd and Dad worked for Singers and I.C.I. 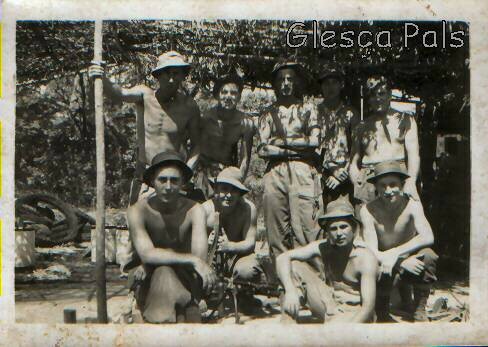 paints division before emigrating to Australia 1959.
taken in Malaya 1949 with some of his Royal Artillery army pals. He was born in Ingram St. moved to Bridgeton & married Nessie Evans in 1952. .... Just finished reading this lovely tribute to our Scottish forces of today's and bygone times. Just found this one of my dad, David Watson in Italy. I fixed up a few of the old scratches on it. I'm not sure of the branch but he was in the 8th Army in the Middle East and then stationed throughout Italy. Jim Waddell was born at 65 Mollinsburn St. Springburn in 1937. The schools he went to whilst there were, Mollinsburn St Primary, Gourlay St, Colston Rd and Elmvale St. He then moved to 3 Glebe St in the Townhead where he went to Townhead Primary and then on to the City Public. 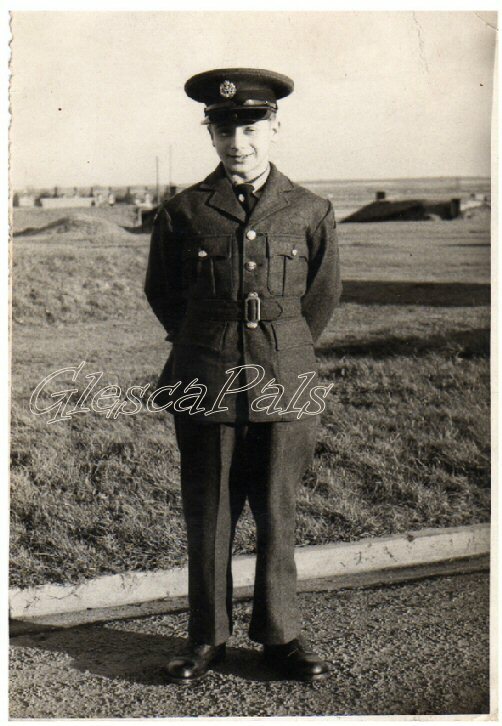 Jim joined the RAF in 1954 and served three years as a cook. After a spell working in Sheffield he returned to Glasgow (his parents had now moved to 14 Morrin Square) where he became a tram driver until just before they were made redundant. Jim got married and moved to Lesmahagow. The marriage didn't last so he went back into the RAF, in 1965, as a Dental Technician. After demob he went to work in Germany, circa 1970, having learned the language. In Germany he was offered a job with NAAFI and he became a shop manager. He returned to England, still with NAAFI in 1983 and lived in Chippenham in Wiltshire, then his wife, who he had met whilst in Germany, moved to their present location. Ramsey Forty Foot near Huntingdon Cambridge. Jim has two children from his first marriage and they both live in Gosport, England. 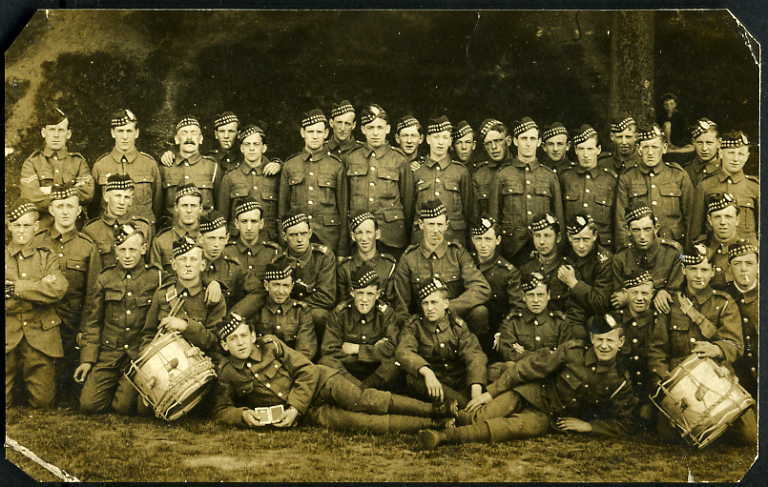 Hi, Webmaister, I have photos of 2 "Brigton Boys" during WW1. 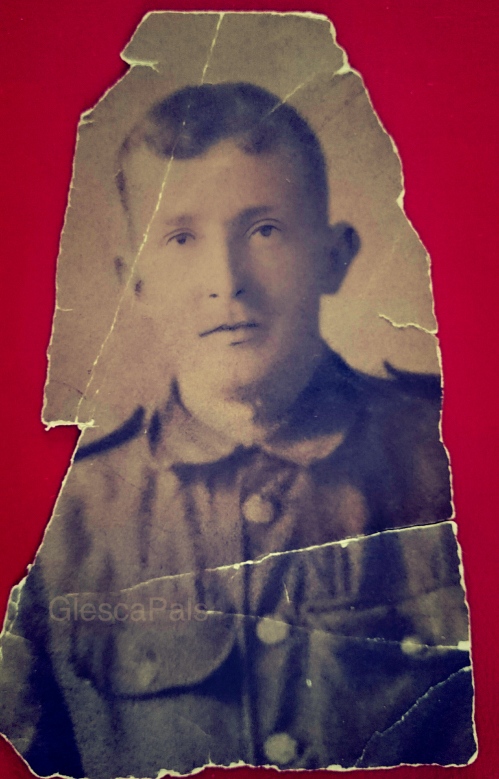 one is of my great Grandfather who was gassed and as a result died in 1923. The other is of my Great Granduncle who was a POW from 1917 -18 and served with the KOSB. He served in the army during WW1 and was gassed in the trenches. 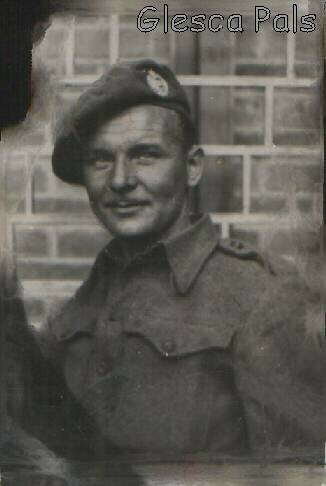 Unfortunately it is unable to confirm what Regiment he was in as most of the archives were destroyed in the London blitz in WW2. William lived at 280 Baltic St., Bridgeton then 309 Nuneaton St., Bridgeton with his wife Mary Watt (nee Bryden) and their children Meg, Bill, John, James, George, Jean, Mary and Bert. The family lived there until after WW1. Sadly Wiliam died in 1923 as a result of the chemical warfare during WW1, he spent time in a convalescent home for recuperation as the photo shows c1920. His wife Mary died in 1953 in Shettleston. 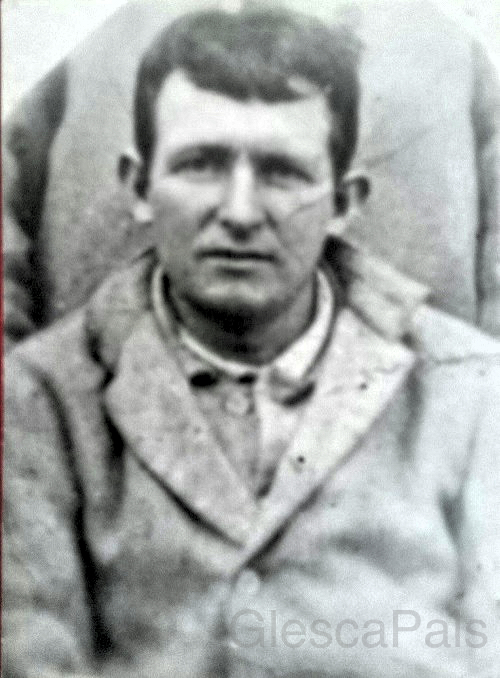 James joined the 2nd Btn KOSB c1908 and was a regular soldier at the outbreak of WW1. He was captured at the Oppy-Fresnoy front on 3rd-8th May 1917 and was placed in "Kreigs ferglassen lager" (POW Camp) in Wustermarke past Dyrotz by June 1917. James lived at 53 Bernard Street with his wife Mary Watt (nee McArthur) and their children Jane, Mary and James. and his wife Mary died in 1973 in East Renfrew. Get your very own family photo and story on this website for a small donation.